Fail2ban: scans log files (e.g. /var/log/apache/error_log) and bans IPs that show the malicious signs -- too many password failures, seeking for exploits, etc. A ZERO COST, fully fledged, full-featured mail server solution. All components are free and open source softwares. WARNING: iRedMail is designed to deploy on a FRESH server system, which means your server does NOT have mail related components installed, e.g. Apache, MySQL, OpenLDAP, Postfix, Dovecot, Amavisd, etc. Otherwise it may override your existing files/configurations althought it will backup files before modifing, and it may be not working as expected. A FRESH, minimal working Gentoo Linux. For example, install Gentoo Linux with stage3. It's recommended to use the latest Gentoo release. NOTE: All packages are built and installed with the latest portage. 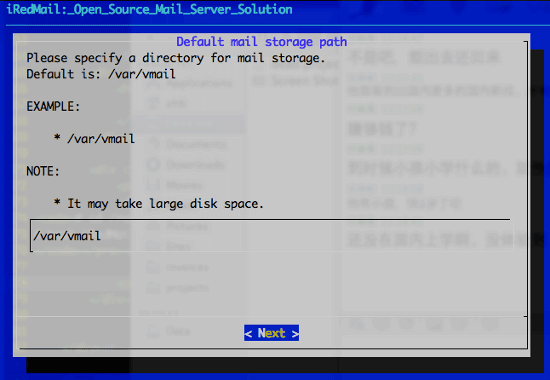 We need to set a FQDN hostname before setup mail server. Hostname <=> IP address mapping: /etc/hosts. WARNING: Please list the FQDN hostname as first item. Verify the FQDN hostname with command 'hostname -f'. If hostname wasn't changed, please reboot server to make it work. 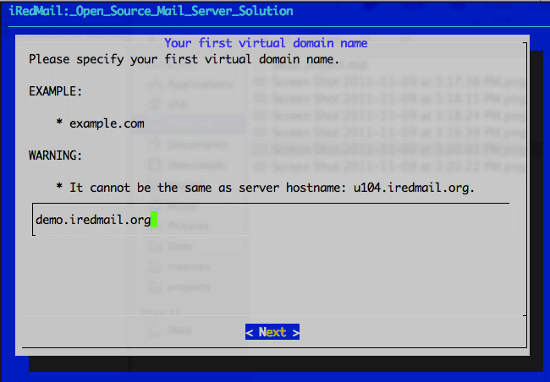 Visit Download page to get the latest release of iRedMail. 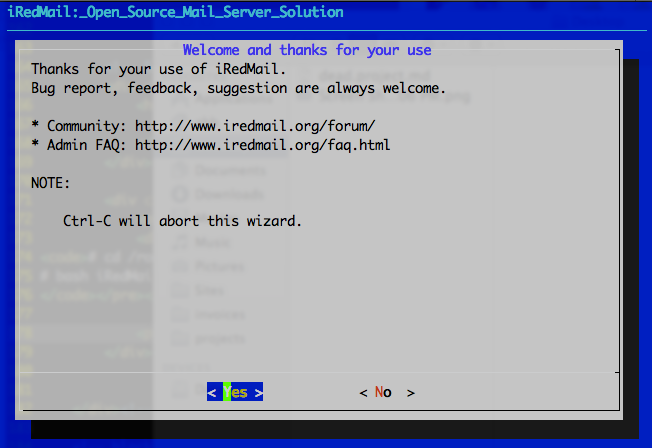 At least iRedMail-0.8.0-beta2 is required. 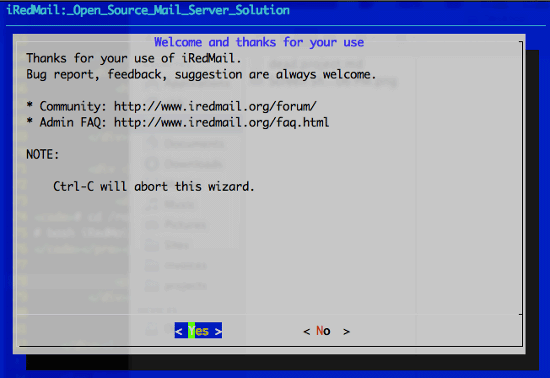 It's now ready to start iRedMail installer, it will ask you some simple questions, that's all steps to setup a full-featured mail server. 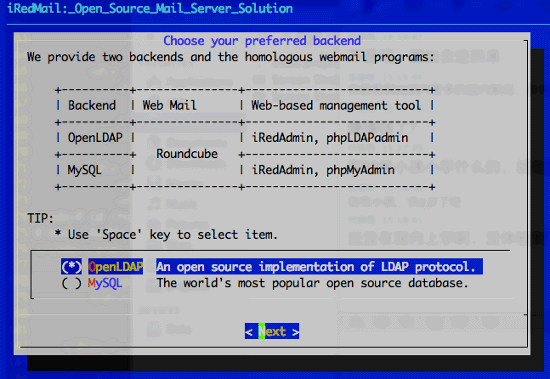 3) Choose backend used to store mail accounts. We will choose MySQL for example in this tutorial, please choose the one which you're familiar with. You can manage mail accounts with iRedAdmin, our web-based iRedMail admin panel. 4) Set password of MySQL root user. 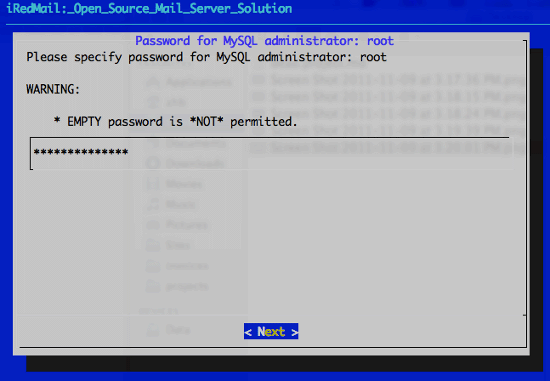 MySQL is used to store mail accounts and application data. e.g. Roundcube webmail, Policyd, Amavisd-new. Admin username is hard-coded, you can create new admins with iRedAdmin after installation completed. Username is hard-coded, you can create new mail users with iRedAdmin after installation completed. After you have answered these questions, iRedMail installer will ask your confirm to start installation. It will install and configure required packages automatically. Type y or Y and press Enter to confirm. 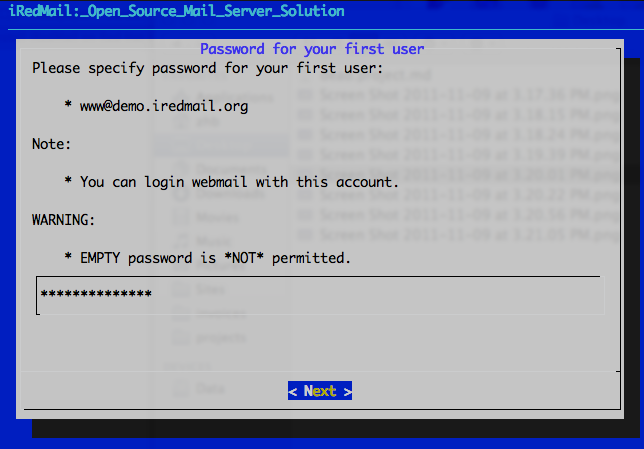 That's all you need to do to set up a free and full-featured mail server. Easy enough? After installation has successfully completed, you can access web-based programs if you choose to install them. 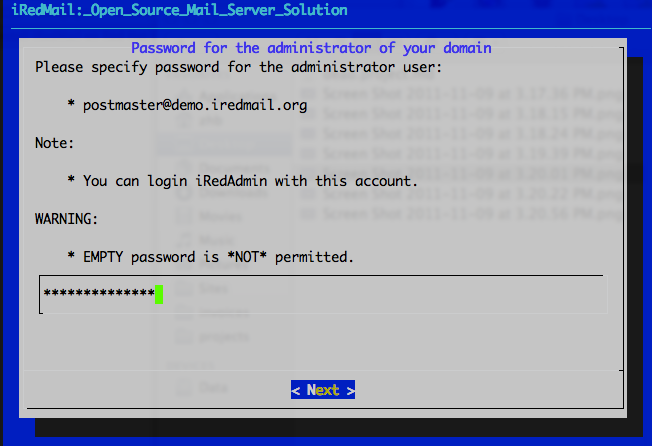 Replace 'your_server' below by your actual server name or IP address. iRedMail project provides fast and effect online support, please post all issues, feedbacks, feature requests, suggestions in our online support forum, it's more responsible than you expected: http://www.iredmail.org/forum/.